Before I begin, I have to say that this review is coming from the view of someone who has never read the Grisha trilogy, and has only read the Six of Crows duology. I really believe this has effected my thoughts on the book so just a warning! I also want to mention I read this book with my bookish bestie Courtney, and we had so much fun doing our first buddy-read together. 🙂 Reading is just a bit more special with someone to share it with! I want to start with the start of the book – because this took me so long to get into. I think part of the reason was because I’ve been in the Shadowhunter world since early December, and it was just so strange to suddenly be thrown into a completely different world. 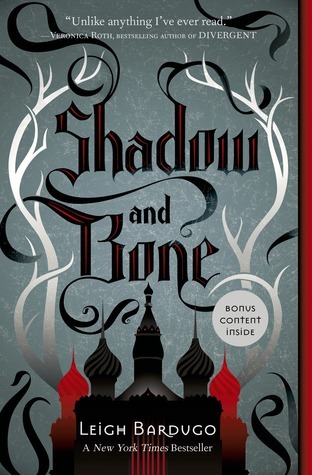 My second reason is definitely because I didn’t receive the world-building I needed from the Grisha trilogy. 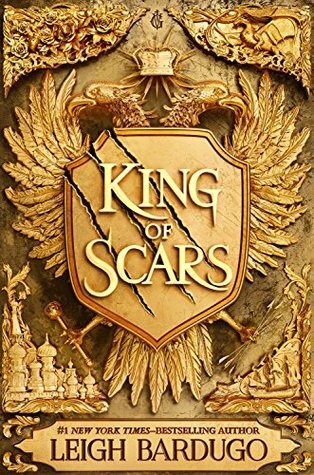 Although King of Scars is very descriptive, it took a lot of concentration for me to understand what was actually going on. So if you want to read Bardugo’s books, I’d honestly say please read her other books first (Grisha trilogy followed by Six of Crows). You need the world building and preparation – and lots of her previous books are spoiled in King of Scars! But despite this, I still really enjoyed King of Scars, especially after the first 250 pages. It took me about 4 days to read the first half, and only 2 to get through the second. Maybe the pacing is a little off because it definitely picks up, but I think this is also partly due to me finally clicking with the world (yes, it took that long). I’ve always said this but I have to point it out again – Bardugo can write multiple POV books like no one else I have ever read. Six of Crows was from 6 different POV, but those books are among some of my favourites. And here we are again, with four POV, yet I loved them all in their own ways. There was such a balance here – each role was unique, and I wasn’t waiting or hoping to get back to a specific person. Overall, what a great book, and the second half really made it for me. The tense edge-of-your-seat plot and fighting scenes were immense, and made me fall in love with Bardugo’s work even more. I’ll definitely be re-reading Six of Crows, Crooked Kingdom and King of Scars once I’ve tackled the Grisha trilogy! Hi all! I’ve had a pretty busy week considering I haven’t been at uni – I’ve spent it catching up with friends and visiting my lovely grandparents. I’m back home now, and I start back at uni tomorrow. I’ve really enjoyed my break but I am looking forward to going back too! I’ve also been reading a lot and I finished City of Heavenly Fire last night. I can’t believe it only took me a month to finish the whole of The Mortal Instruments! 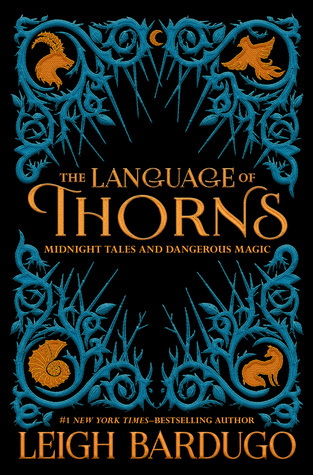 Anyway, I picked up King of Scars this morning, and it reminded me of one of my favourite books of last year – The Language of Thorns. My review is here, and you can see a beautiful quote from this beautiful book below. Travel to a world of dark bargains struck by moonlight, of haunted towns and hungry woods, of talking beasts and gingerbread golems, where a young mermaid’s voice can summon deadly storms and where a river might do a lovestruck boy’s bidding but only for a terrible price. This collection of six stories includes three brand-new tales, all of them lavishly illustrated with art that changes with each turn of the page, culminating in six stunning full-spread illustrations as rich in detail as the stories themselves. This book is absolutely stunning. I can’t believe it’s taken me until now to read this, but I find short stories so hit and miss! Some (*cough* Tales of Beedle the Bard *cough*) can be blatant gimmicks. And others, like this, can be downright beauty. I am so, so happy that this one fell into the latter. All 6 of these stories are based on classic fairytales, but with a new and fresh take set in the Grisha universe. I haven’t actually read the Grisha trilogy yet, but I loved Six of Crows and Crooked Kingdom! What I love about this book is you don’t actually have to read any of Bardugo’s books to understand any of the tales. I actually can’t chose a favourite of these stories, because they’re all so beautiful in their own ways. Ayama and the Thorn Wood, The Witch of Duva and The Water Sang Fire definitely all stood out for me though! I love how each story took up around 50 pages, and I think having that time and space is just crucial for the reader to know the character enough to connect fully to the story. I can’t write this blog post without telling you all about the incredible illustrations that come with the hardback edition I own! Round every single page there’s a band of illustrations which build up as the story progresses. For example, in one story we start with a fox, and slowly the band builds up until we have trees and other forest creatures around the perimeter of the double-page spread. I can’t even begin to explain the beauty here, the amount these drawings add to each story and make them feel like fairytales. I honestly have so much to say about this book that I’m going to have to stop myself from rambling and just say this. Leigh Bardugo, you have done short stories right. I have never experienced a novella quite like this one. It stands out in the fairytale experience, and it took me to many different worlds between the pages. I found it perfect for this festive time of year, so comforting and interesting. I’m sure these stories are ones I will come back to many times again!